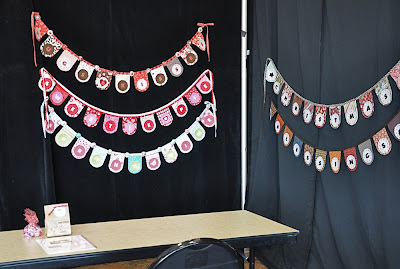 For this years quilt retreat I had a really nice quilt in mind but a few months ago Amy asked me to teach the Hugs & Kisses Banner from my most recent tutorial on Moda Bake Shop. So, I agreed. I had 6 people sign up for my class and during the retreat I helped 3 other gals cut wool letters and scalloped circles so they could make them later. It was so fun to see what banners my students decided to make and what fabric they used to make them. 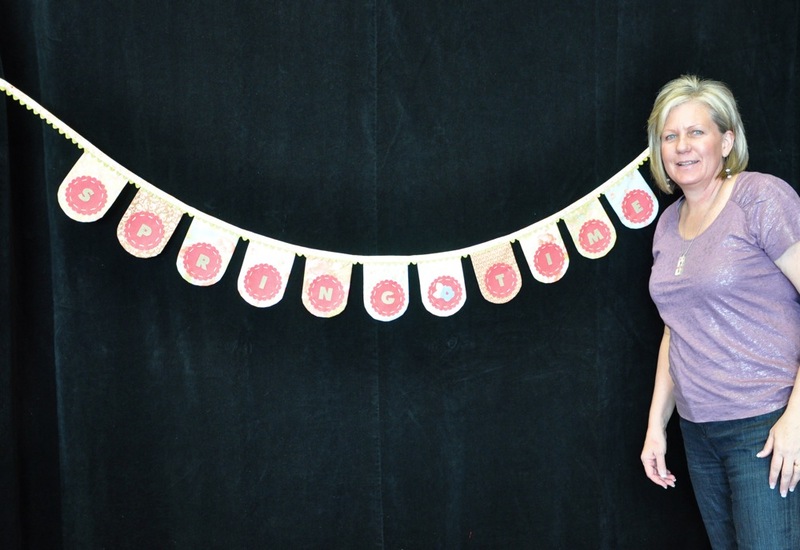 Shelly made the "SPRINGTIME" Banner, Kimberly made the "BLESSINGS" Banner, Amy and Mindy made "BIRTHDAY" Banners, and Mindy also made two more Banners with her daughters names on them. The Banners were all so CUTE!!! 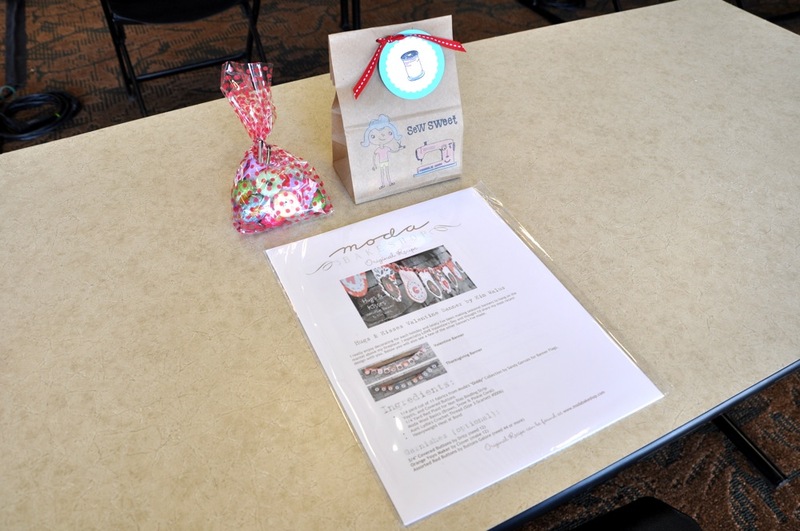 I spent most of the morning finishing up the little gifts that I made for my students and setting up the classroom. I finished just in time for lunch. 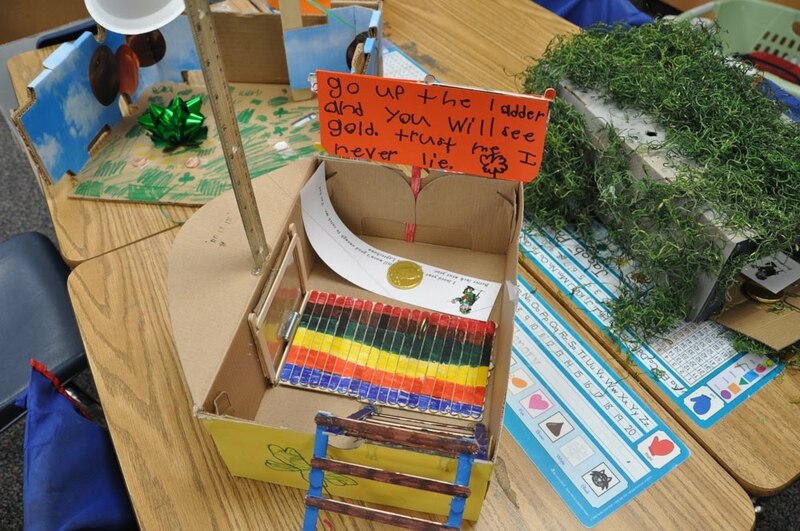 This is a picture of what I set out for each student. It consisted of a bag of treats, a pincushion ring I made for them, and a little "What-Not" Bag that I almost made for them. I had it all prepared so all they had to do was sew one part. I promise to show you the gifties once I take pictures of them. Here are some of the banners I displayed. 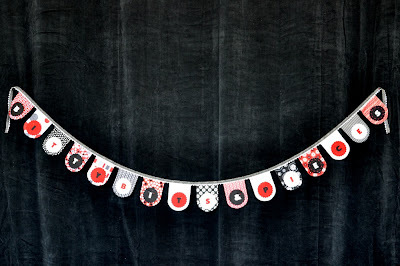 Here's the banner I made for my sewing room. The banner says the name of my blog. I was pretty distracted during the retreat and didn't get pictures of the other banners even though I had every intention of doing so, but here's Shelley's "Spring Time" Banner. All the banners turned out really nice and I loved spending time with all of the ladies in my class. It's always a highlight of my time spent during the retreats. I'm looking forward to next year and should probably start thinking of something new to teach that everyone might like to make. If you had a CHOICE. 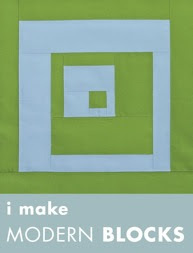 . .
What would you CHOOSE to MAKE at a Quilt Retreat? Any thoughts or suggestions would be great! Thanks!!! Hi Everyone! 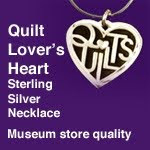 I'm home from my quilt retreat and back to reality. 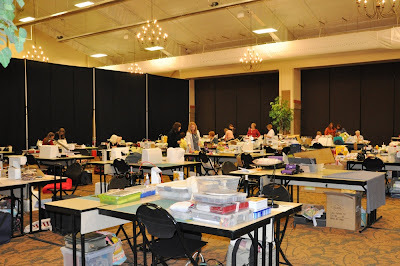 I had a GREAT time with all of my wonderful quilting friends and wish that the retreat had lasted a few days longer. 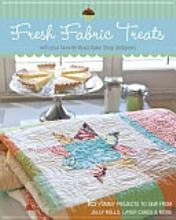 For some quilters this was their 1st year and for others this was their 4th year which is exactly how long Amy's been doing her Quilt Retreats. For me, this was my 3rd year. 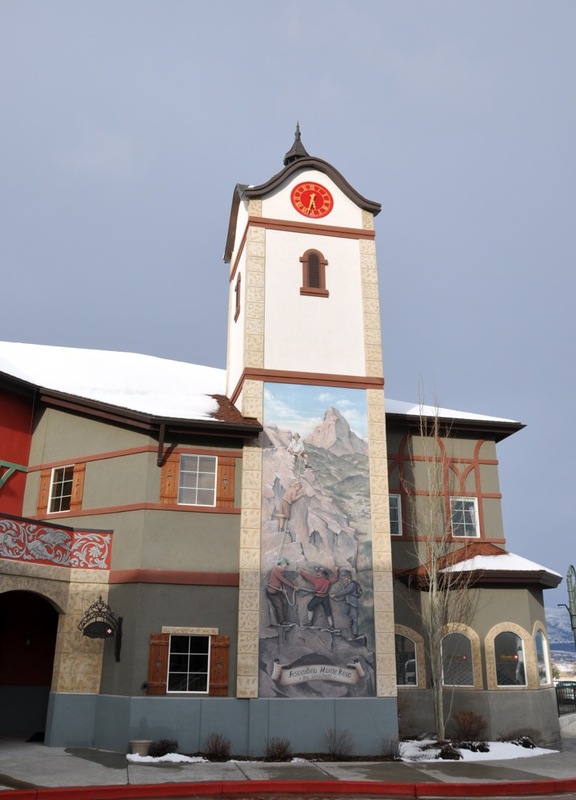 Kayla and I arrived at Zermatt around 8:30am Wednesday morning and immediately started hauling our stuff into the BIG Conference Room. It was really really nice and all 80+ of us fit in the space with room to spare. We even had two good size classrooms set up at both ends of the Conference Center. The chandeliers and florescent lights provided wonderful lighting at night and the large ceiling to floor windows provided the best natural light during the day. 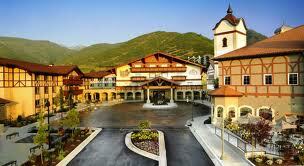 On Monday evening a few of us ate at the Resort's Restaurant called Schneitter's. It was very pricey but very good. The steak was well worth the cost and I enjoyed every morsel of the meal. 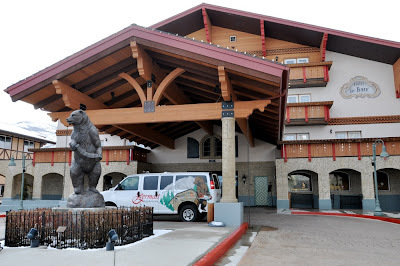 Another favorite stop was the Resort's Bakery. 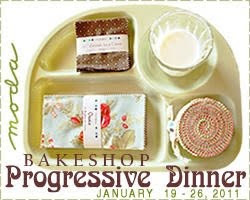 Amy gave everyone a daily voucher to use at the bakery. I think the favorite treat was Gelato. Every day they had a few new flavors to try. My favorites were the Passion Fruit and Raspberry Gelato's. I also tried the Cream Puffs and thought I had died and gone to dessert heaven. The Cream Puffs were AMAZING! I brought home a few new projects and a few extra pounds. lol. 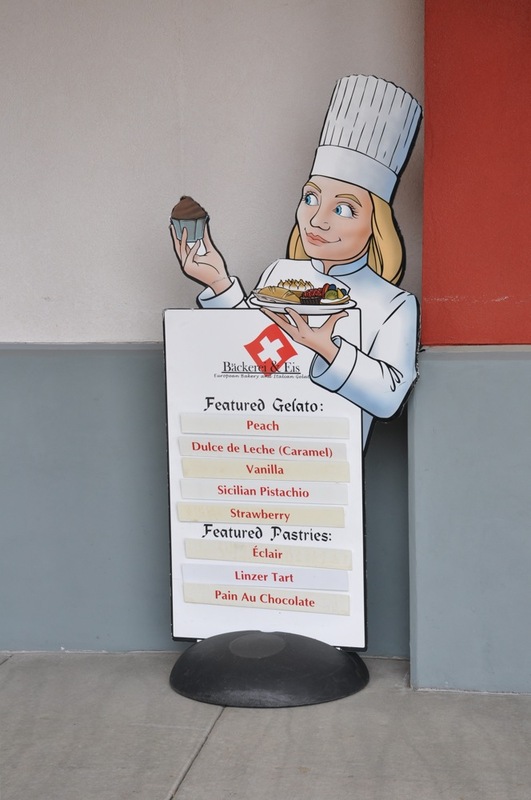 I'm so glad the bakery is NOT accessible or I might have to make a few extra visits! 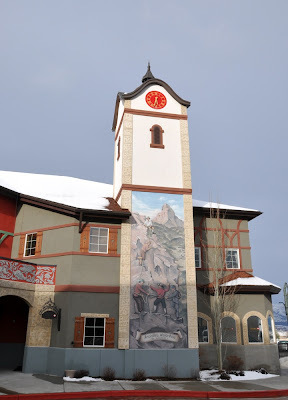 I took 3 days off work just so I could run off to my favorite American Quilting Quilt Retreat located this year at Zermatt Resort in Midway, Utah for some much needed rest and I hope to get a lot of sewing accomplished in between the resting. 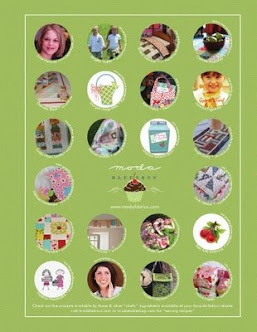 I'm bringing just one major project and a few little projects to keep me busy when I get tired of the big project and the little projects will help make me feel like a finisher! lol. I also brought along a very good book!!! 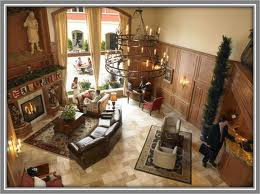 I think I will have to sit and relax there in the lobby. You might find me with my very good book right on that overstuffed chair by the fire. 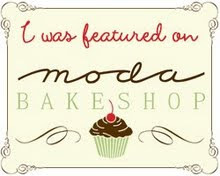 On Thursday, I will be teaching my Hugs & Kisses Banner that I did for Moda Bake Shop. It's a custom class where you can come and make a banner for any holiday, any event, or any child's name, etc. 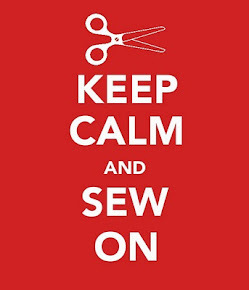 I'm really looking forward to seeing what each person decided to do and what fabric they picked. 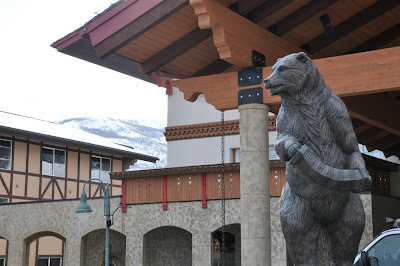 I'm bringing my camera so, I will take lots of pictures and share some of them with you when I get back. Have a great week and we will blog with you again soon. Did you miss me? I missed me too. lol. 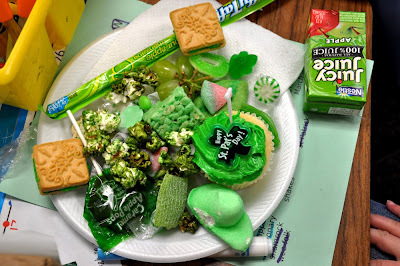 I will have to explain later but right now I want to say Happy St. Patrick's Day and share with you a few pictures I took today at school. 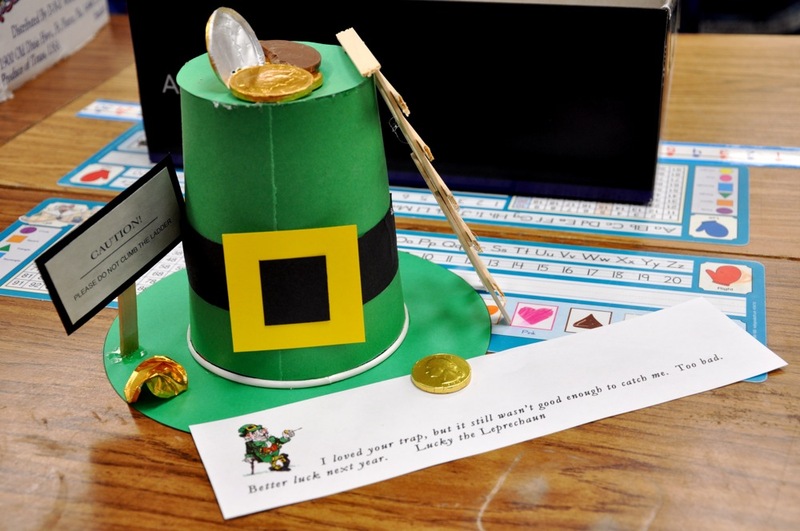 The 1st graders have been working at home on their Leprechaun traps and yesterday they all brought them to school to see if they could catch a few of them during the night last night. 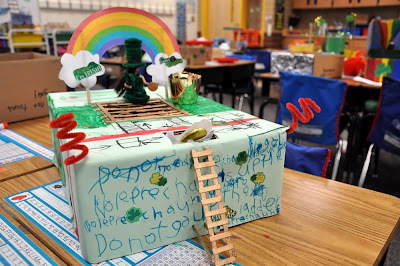 They all came to school really excited to see if any of them had caught a Leprechaun. 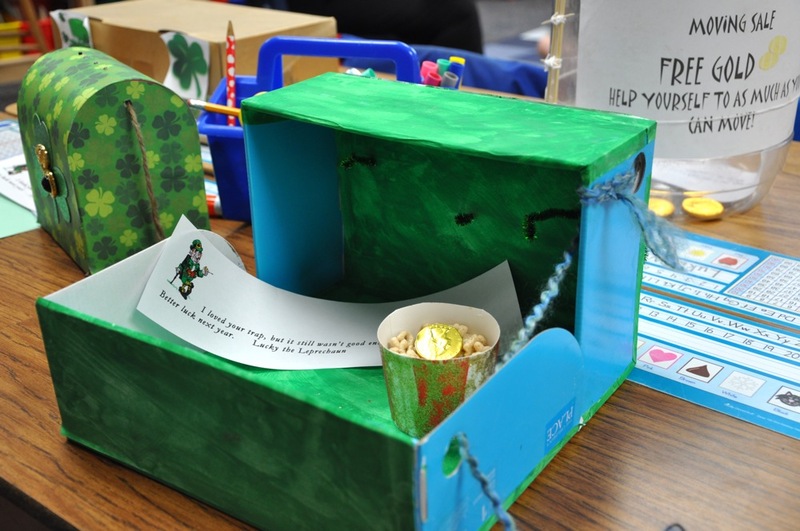 Some of the kids thought they had seen glimpses of Leprechauns during the week and a few kids even found a few notes in the classroom from the Leprechaun. It's been fun watching their excitement grow as we learned about Leprechauns these past couple weeks. 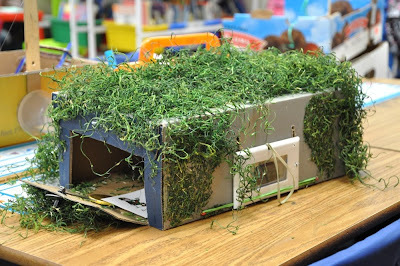 This first trap was made by the student I shadow. 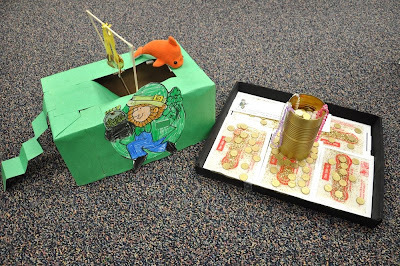 He told me that the Leprechaun climbed up the ladder to propose to the girl Leprechaun and when he stepped off the ladder he would fall into the trap. 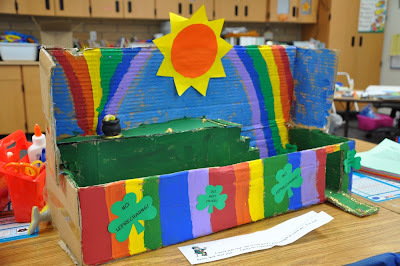 If you see the open area on top of the box, that's the viewing area where you can look in and see the Leprechaun. I thought it was a very clever trap and it made me smile and giggle as he told me how his trap worked. Very Cute!! When the Leprechaun climbs up the ladder and stops off to get the gold he falls through the slit in the top of the hat. The slit is camouflaged by the gold coins. I love how this one is decorated with a double rainbow and it's own little pot of gold that hides a trap door that drops him into the fake hillside below the pot. The Leprechaun climbs the ladder even though there are warning signs telling him to stay off the ladder. lol. Of course, he falls in when he steps off the ladder. Another trap door. Watch out!!! This trap has a door that triggers shut when the Leprechaun steps over the threshold. The lid of this trap falls on the Leprechaun and traps him inside the box. 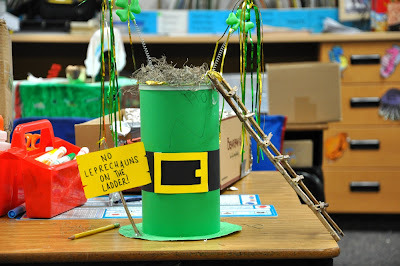 When the Leprechaun reaches for the gold dangling from the string he falls into the pit. 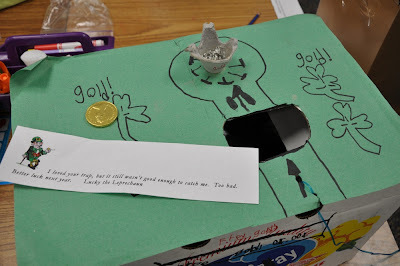 The other trap is camouflaged by glitter and gold strewn about the VERY sticky paper and traps the Leprechaun when he makes his move toward the pot of gold. I love the instructions on the sign that says. . .
"Go up the ladder and you will see gold. Trust me. I NEVER LIE!!! lol. Here is a sampling of the Green Treats that each of the kids brought to the St. Patrick's Day Celebration. Lots of sugar, some grapes, and there was even broccoli, although I don't see it on this particular plate, hehehe. I thought the apple juice was a great idea, too!! I hope you enjoyed our little tribute to St. Patrick's Day.